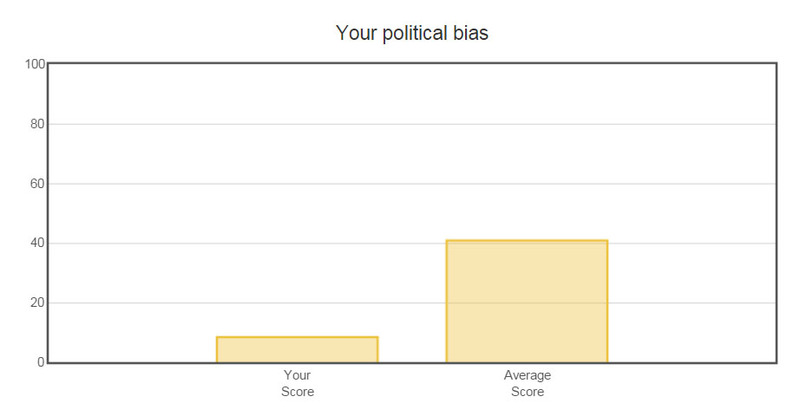 Level of my political bias, according to an online test of political bias. Click on the graph to see it more clearly. A piece showed up at Vox this morning about a test of political bias. This is the kind of thing I love, and tried hard to take the test, but apparently lots of other people tried at the same time, and I couldn’t get through for a while. Eventually I got through and learned that I’m not terribly biased, politically. My total bias (based on answering questions wrong, in a particular direction) was 8.3%, which is less biased than about 75% of other test takers. This made me pretty happy, because I don’t want to be biased….but that made me wonder, why not? Can’t bias be a good thing? I’m biased about my kids. I think my kids are the cutest, most caring, considerate, overall best kids in the world. I have absolutely no empirical evidence to support this, and I don’t care. So why do we think of “bias” as a bad thing, not just a thing that is. Bias has been getting a lot of attention lately. Discussions of police actions and how we treat other people has raised attention of a specific type of bias, called implicit bias. I’ve taken advantage of the tests of implicit bias that a group from Harvard has available on the internet. There are tests about our implicit attitudes about skin tones, sexuality, weapons, presidents, race, religion, and a host of other things we see every day. These tests are needed because we aren’t always usually aware of our implicit biases. We know our explicit biases all too well, but the implicit ones are harder to see, especially in ourselves. Some of us don’t seem to want to look for these things. We don’t want to think of ourselves as racists or bad people, and we have it stuck in our heads that saying we have implicit bias is a secret code for calling us racists. So if somebody is told they likely have a bias about skin color, they immediately get defensive as if they’re being called a bigot or racist. This isn’t the case, and those of us talking about these things in a rational way (Spock-like), need to work harder to make that clear. What, then, is the difference between bias and racism? Let’s start with how they are the same. Both generally include some sort of prejudice. When we’re talking about a bias related to something like skin color, both racism and bias are focused on that single aspect of an individual, and lead us to make judgements about that individual based on our perception of the group. So it seems fair to say that racism includes a bias against a particular group, but the converse isn’t fair: bias can occur in the absence of racism. In fact, bias does occur in the absence of racism, at least in the absence of conscious racism. The interpretation is described as ‘automatic preference for European American’ if you responded faster when European American faces and Good words were classified with the same key than when African American faces and Good words were classified with the same key. Depending on the magnitude of your result, your automatic preference may be described as ‘slight’, ‘moderate’, ‘strong’, or ‘little to no preference’. Alternatively, you may have received feedback that ‘there were too many errors to determine a result’. This isn’t surprising, and it turns out that it’s true of most people, black and white. In an early study using the online tests, scientists found that explicit measures (responses to questions like, “do you like black people more than white people?”) showed a moderate preference for white by white people taking the test, and a strong preference for black people by black people taking the test. These are the outward measures, conscious and self-identified like or dislike for people of your own color. I guess that’s not surprising. People tend to like people like themselves, and maybe they often like them a bit better than “other” people, no matter who those others might be. When things get really interesting is when the same respondents’ implicit measures were examined. White people, who showed a moderate explicit preference for whites over blacks, showed a strong implicit preference for whites over blacks. I guess that’s not too surprising either. But, when black respondents were tested on implicit measures, they showed a slight preference for whites over blacks, even though they showed a pretty strong explicit preference for blacks over whites. Black and white people BOTH showed an implicit preference for whites over blacks. This is not racism, at least not as we’ve defined and stigmatized it before. This is something we all live with, mostly without even knowing it. The person with no explicit preference for their own race, can have a strong implicit preference that they don’t even know they have. Results from my religion IAT. Click to see a bigger (readable) version. For another example, let’s look at my attitudes toward religion. Those of you who know me know that I am not a religious person. I’ve been quite outspoken about being very anti-theocracy and I really do not like, even hate, the idea of somebody pushing their religious beliefs on other people under the guise of “religious liberty.” There are plenty of Christians in this country who feel they are being persecuted (I think they’re wrong, and I’m working on a post or two about that phenomenon that I’ll save for later), and my guess is that I could quite easily be the personification of that persecution. My explicit attitudes about religion are pretty clear. I don’t love them, although I have a respect, even an envy, for the comfort and sense of community that they bring to people. I do not explicitly hold any religion above another, except it might be fair to say that I have a particularly negative explicit reaction to some Christian groups, particularly those that embrace a literal interpretation of the Bible. I have a fondness for the Dalai Lama and if asked, I would probably say that Buddhism is the most peaceful of the major world religions (without any kind of deep thought put into that statement). But those are my explicit associations with religions. Turns out that my implicit and explicit selves don’t line up here. Based on the religion IAT (implicit association test), I have a more positive view of Christians than I do of Jews, a more positive view of Jews than I do of Buddhists, and a more positive view of all three than I have of Muslims. This is actually the second time I’ve taken the Religion IAT (I took it today to generate the image here), but the results were pretty similar. The first time I took it, Judaism and Christianity were more clustered, with the other two spread the same way, but the overall direction was the same. One caveat, the image shows relative positivity. The actual difference between them may be very small. This version of the test unfortunately does not report anything else. Either way, this certainly does not line up with my explicit senses. So what does it mean? It means that I have some deeply ingrained positive view associated with the religious groups I encounter the most. Comfort in familiarity maybe. It could mean that I have a deeply ingrained negative view of a religion that is consistently associated by the news with trying to hurt Americans. I don’t know, and it doesn’t matter all that much to me. I still don’t consider myself somebody who would discriminate against Muslims for being Muslim, or that I would give special (better) treatment to somebody just for being Christian, but it does mean that I might do those things, without even thinking about it. It does mean that I should probably pay a bit more attention to my actions and my attitudes as I interact with people of different faiths, to be sure that I’m treating them all equally. The first step toward fixing a problem is acknowledging that it exists. Some people are fine being racists, some people openly and genuinely hate people of another race and believe that those “others” don’t deserve good things and shouldn’t get good things. For them, there is no problem. But for the majority of us, who think that the color of somebody’s skin shouldn’t make them have more or less opportunity, that the color of somebody’s skin shouldn’t make us treat them differently, there are clear problems. Unemployment is higher among blacks than it is among whites. Black people earn roughly 66 cents for every dollar earned by white people. The poverty rate is close to 27% of black households, but about 10% of white families. The rate of black Americans without health insurance is almost twice the rate of white Americans without health insurance. Incarceration rates, sentencing for the same crimes, even breast cancer survival rates favor whites over blacks. There are so many factors that could explain so many of these differences, and my goal is not to go into them here, or say that these differences are anybody’s fault. My point is that these differences exist, and at least some of these differences can be the result of implicit associations. For those of us who do not want to be racist. For those of us who DO believe that all people should have a fair chance, and shouldn’t be judged by the color of their skin, we need to come to grips with our own implicit attitudes. We can do this without judgement. We can do this without having to ask if we’re really secret racists. We can do this while understanding that nobody among us is perfect, and that maybe our implicit attitudes are one of our flaws, that might be not to hard to fix. What can I do about an implicit preference that I don’t want? Keep in mind that the IATs on the website might not be perfectly accurate. That said, it is very possible to have an implicit preference that you don’t want. One solution is to seek experiences that could reverse or undo the patterns that created the unwanted preference. For example, you could choose to avoid watching television shows that promote negative stereotypes of women or minorities. You could read materials that opposes the implicit preference. You could interact with people or learn about people who counter your implicit stereotypes. You can work to remain alert to the existence of the unwanted implicit preference to make sure that it doesn’t influence your overt behavior. You can also try consciously planned actions that will compensate for your implicit preferences. For example, if you have an implicit preference for young people you can try to be friendlier toward elderly people. Research shows that implicit preferences are quite malleable so it is possible to manage and change them if you want to. But how? How do we change? Well lots of people have been working on this. An episode of This American Life has a great segment about training programs that seem to be making a difference in police departments. There are reports of companies like Google, Dow Chemical, and Novartis working with their employees to help with their diverse workforces. One thing that seems particularly important in all of this is not trusting our guts too much. Our guts are wrong, a lot. Look into facts, boring, dry, unaltered data. Your gut tells you that blacks are more likely to be on food stamps…check the numbers. Your gut tells you that blacks are more likely to commit violent crimes, check the data. All of this information is available to us thanks to the internet. And my suggestion is to avoid websites that tell you about what the data show; go right to the source. Interested in crime rates in the United States? Go to the FBI’s Uniform Crime Reports. Interested in poverty rates? Go to the United States Census Bureau’s reports. There’s a problem with this: it takes some work. But good things often do.